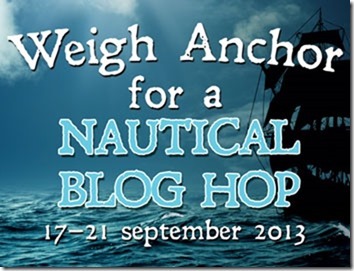 Anchors Aweigh for the Nautical Blog Hop! Helen has brought together 23 authors, ranging from popular authors such as Julian Stockwin to newcomers like myself, from all across the English-speaking world, each of whom has written a story with a nautical theme. My contribution is ‘Blood, Ice and Honour’ which you will find on a page on this blog (about the Greenland vikings) and the 22 other links are listed below. The Hop runs from 17 to 21 September, so tuck in to a nautical feast. PS Since posting the list of links for the Blog Hop I have been away in Dorset, researching for my next novel, and while I was away the list was amended several times. Best call at the Home Port for an up-to-date list. Judith Starkson has asked to note that her link is now judithstarkson.com/articles/the-wonders-of-bronze-age-shipwrecks. My contribution to the Hop, BLOOD, ICE AND HONOUR, is not related to any other work I have written, but since several other hoppers have given pieces of their forthcoming work you might like to see the prologue to THE FROZEN DREAM, another arctic adventure which I plan to publish shortly. It is based on the Chancellor-Willoughby expedition to open a trade route to China over the north Pole in 1552. You will find it on the page entitled ‘Frozen Dream’. This entry was posted on September 10, 2013 by edward654 and tagged Helen Hollick, Nautical Blog Hop.